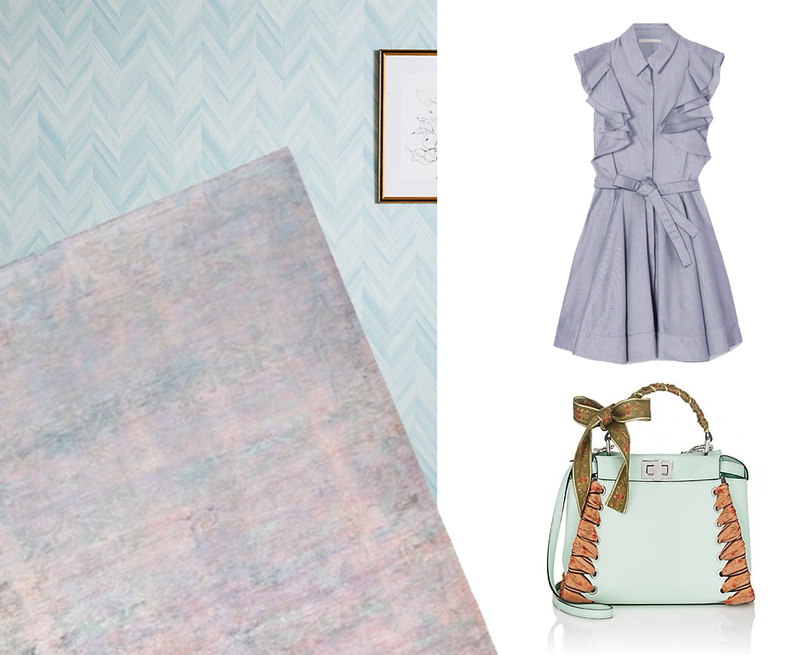 In case there was any question about what season we’re in, pastels are here to remind us it’s spring! 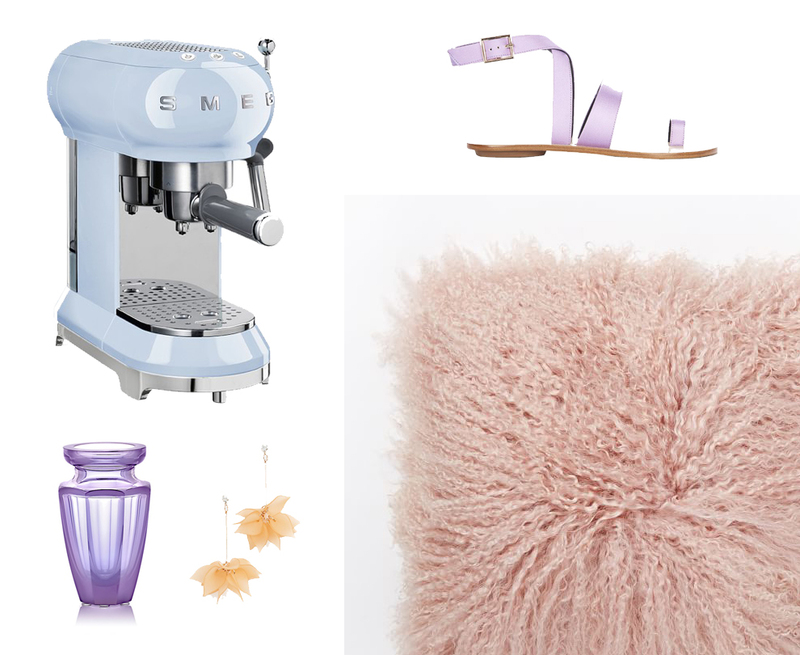 The season’s soft shades are coloring of-the-moment fashion items and classic home decor essentials. Arguably the prettiest palette of the year, I’m loving the toned-down hues in every color of the rainbow -- from muted pinks to mellow yellows to subdued blues. Here are few pastel pieces that caught my eye. ABC Home & Carpet Color Reform Spectrum Overdyed Rug -- This stunning one-of-a-kind rug harmoniously blends several pastel tones to create a totally tranquil aesthetic I could stare at forever. How pretty would this be in a closet?! Anthropologie Gradient Chevron Wallpaper -- If you’re open to a dramatic decor change, this gradient chevron stripe wallpaper embraces cool blue pastel hues, while still maintaining a fashionable print that can liven up a vanity or changing room. Antonio Berardi Ruffled Cotton-Chambray Mini Dress -- I’m lusting for this chic chambray mini dress! The ruffled sleeves, full skirt and tie waist are ingredients for a flattering flit, and the effortless color makes it an essential pastel piece to add to the wardrobe. Fendi Peekaboo Mini Leather Satchel -- Fendi continues to be a major fashion force, dominating the style scene with a blend of classic and new designs. This pale green iconic Peekaboo mini satchel is modernized with brown floral hand-whipstitched ribbon, perfect for carrying life’s necessities. 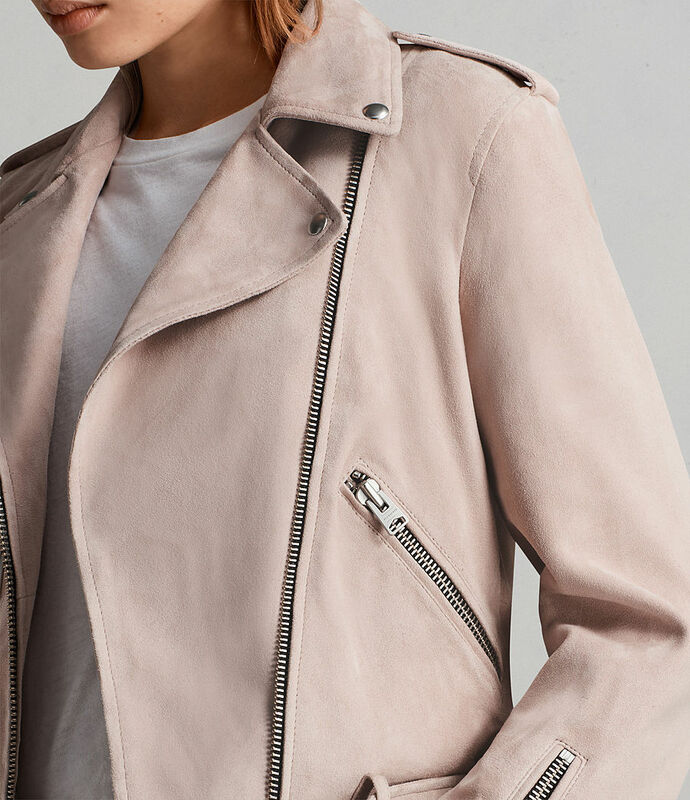 All Saints Suede Balfern Biker Jacket -- A pink suede jacket may not seem like a wardrobe staple, but this pastel pink beauty is surprisingly versatile. From wearing over a flowy floral day dress to pairing with black denim and heels for evening, this romantic, yet edgy jacket can easily fit into the rotation. MOSE USA Eternity Crystal Bud Vase -- This lilac-colored mouth-blown crystal bud vase features a stylish faceted surface and embodies the original design by Franz Voigt, circa 1940. It’s ideal for staging and showing off spring’s best offering...beautiful blooms! Sashi Lucite Rose Earrings -- Pastels can sometimes come off as really feminine and classic, so I love these fun yellow lucite earrings that deliver delicate drama and a punch of contemporary cool. Smeg Espresso Machine -- With the exception of coastal kitchens, blue isn’t often seen in kitchens; but, this retro-style espresso machine in a subtle blue hue brings just the right amount of nostalgia and charm to the kitchen. I love how it feels like it’s straight from Italy in the 1950s! Tibi Hallie Sandals -- Strappy sandals are a spring/summer staple and these lavender satin stunners brilliantly blend luxury and utility for everyday wear. West Elm Mongolian Lamb Pillow Cover -- Throw pillows are such an easy way to change or dress up a space. And, these lovely Mongolian lamb pillow covers -- with a warm-weather color and cold-weather texture -- can easily transition from season to season.